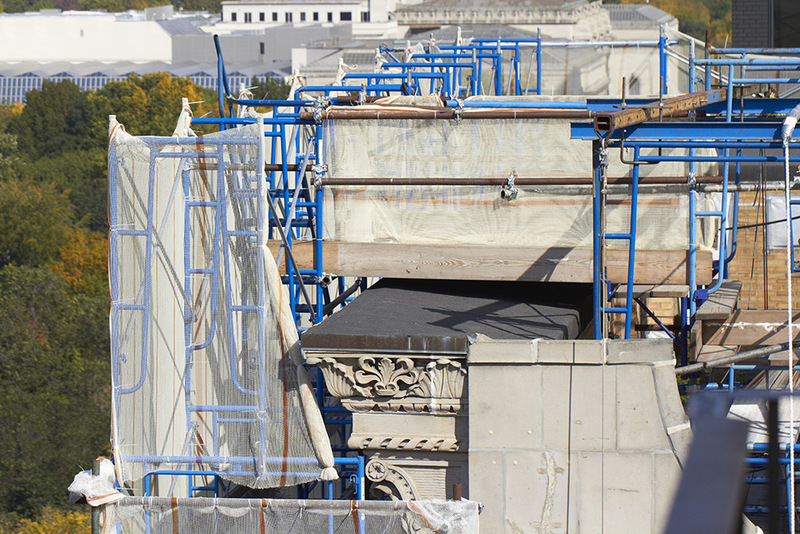 October 22, 2013, there is no sign that this scaffolding will be coming down any time soon. November 3, 2012 - Last year around this time Palemale is about to land on his nest, demonstrating that at this time of the year he is actively getting it prepared for his next nesting season. The management of 927 Fifth Avenue (Brown Harris Stevens) shows no sign of concern for the hawks. This non-emergency work is being carried out without any urgency to finish it quickly. November 3, 2012 - Activity on the 927 Fifth Avenue nest. This picture prooves that the hawks need to be on their nest at this time of the year. October 25, 2013 - Work is being carried out for several months at a snail's pace.